Microsoft's program allowing potential customers to try a Surface Hub for 30 days before buying it will start on Feb. 15. The try-and-buy program is available only through Surface Hub resellers in North America, Asia, and Europe. A list of resellers can be found on Microsoft's website. 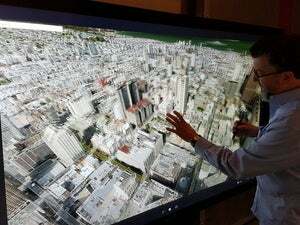 The Surface Hub is a gigantic Windows 10 computer available with a 55-inch or 84-inch screen. The 55-inch model is priced at US$8,999 and the 84-inch model is $21,999. The computer is designed for collaboration, videoconferencing, and whiteboarding. It runs a custom version of Windows 10. It makes sense to try out a Surface Hub before plunking down a large sum to buy it. The Hub is different from a regular Surface tablet or PC, with a bit of a learning curve to get familiar with the large-screen computer. But once mastered, Surface Hub could change the way people interact and collaborate in meetings. Here's how the try-and-buy program works: A reseller will install Surface Hub for a one-time fee, and you'll be able to try it for 30 days. The fee may vary, and Microsoft couldn't provide an estimate. You can then decide whether to buy it after 30 days. So far, Microsoft has shipped the Surface Hub to 2,000 customers in about 24 countries. The try-and-buy program isn't available through Microsoft's retail stores. Among Microsoft's Surface Hub customers is Convene, a company that hosts a network of hundreds of meeting spaces in three cities. The Surface Hub aids in the transition of the workplace from analog to digital, said Chris Kelly, president and co-founder of Convene. Using the Surface Hub isn't complicated, Kelly said. It feels like an extremely versatile digital white board, and it can host video conferencing or collaboration session without affecting the flow of a meeting. At the end of a meeting session, all the data is wiped out, just like on a regular whiteboard, Kelly said. For Convene, the Hub has been an effective brainstorming tool for both remote and in-office users. It improves the level of productivity from a meeting, Kelly said. There are other innovative uses of Surface Hub emerging. Microsoft and SoftBank Robotics are developing a system for Surface Hub panels to make retail shopping recommendations based on buying trends collected from sources like mobile devices, point-of-sale purchases, and other data repositories. Microsoft's Azure cloud service will play a big role in that system. The 55-inch model has a high-definition 1080p screen, while the 84-inch model has a 4K screen. One drawback is Intel's old Core chips based on the Haswell architecture, which was introduced in 2013. Other features include 128GB SSDs, 8GB RAM, 802.11ac Wi-Fi, and two full HD front-facing cameras. The Surface Hub also has a gigabit ethernet port, one USB 3.0 port, and two USB 2.0 ports. The display slots include HDMI, VGA, and DisplayPort.